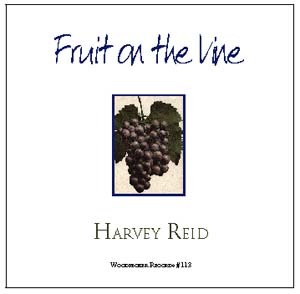 Harvey Reid's recordings are available at concerts, by mail from our web store, phone, e-mail and a few specialty stores. A few titles are available new from Amazon.com. We do not share your data with anyone or sell your name and address. We keep most things in stock, and always ship promptly. Currently our only artists are Harvey Reid & Joyce Andersen. All titles are 60+ or 70+ minutes of audiophile music, with virtually no edits, overdubs or multi-tracking. Our shopping cart calculates various kinds of shipping worldwide. Orders going to Maine will be charged 5.5% sales tax. LISTED IN REVERSE CHRONOLOGICAL ORDER.. The companion CD to the book of the same name that shows how beginners can play these 14 iconic songs with only simple 2-finger chords. Harvey and Joyce Andersen sing these songs using only the 2 middle fingers of the left hand in Liberty Tuning. An amazing new idea for beginners and children. 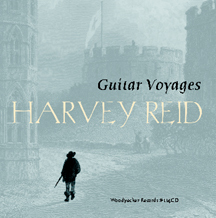 A remarkable solo guitar instrumental album, played with only the middle 2 fingers of the left hand, to illustrate the musical power of Harvey's new discovery Liberty Tuning. 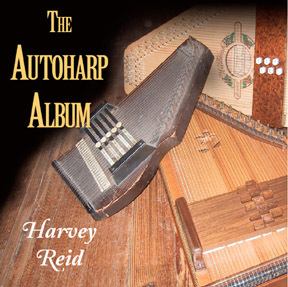 After 10 years, Harvey has finally made a 2nd autoharp album. 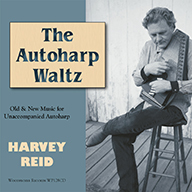 Mostly solo arrangements of traditional standards plus some great new originals-- a "must-have" for Harvey's autoharp fans. Many of Harvey's best partial capo songs assembled in one place! Collected from 11 prior albums spanning 25 years, they showcase 9 different partial capo configurations. Mostly remixed and re-mastered from earlier recordings, with some new recordings & unreleased tracks. * Just guitar and voice- no distracting commercial production. The best of Harvey's ground-breaking partial capo work collected in one place! 18 solo guitar instrumentals, featuring mostly 6-string fingerstyle, with some slide, 12-string and 2 flatpick pieces. Mostly remixed and re-mastered from earlier recordings, with some new & unreleased tracks*. 12 solo guitar instrumentals, featuring mostly 6-string fingerstyle, with some slide, 12-string and a little flatpicking. Collected, remixed and re-mastered from earlier CD's. Stellar guitar playing, stellar sound. 12 solo guitar instrumentals, featuring mostly 6-string fingerstyle, with some slide & 12-string. Classical, rags, jigs, etc. Collected, remixed and re-mastered from earlier CD's. "A Glimpse into Maine's Hidden History"
One of Harvey's amazing concerts caught on camera. 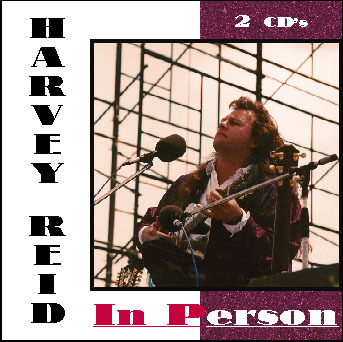 Beautifully filmed with 3 cameras, a pro director and lots of great close-up footage, and 16 great songs with Harvey on 6 & 12-string and slide guitars and his inimitable autoharp. 71 minutes of concert footage. Plus bonus "hidden" music tracks-- you get Track 1 of 14 of Harvey's CD's.This is Harvey in action, doing a great show for a great audience, with some of his best-known songs plus some less-common ones. Fans have been raving about it. Except for a little rhythm guitar and some duets with the violin, it is all solo. Reid showcases his uncannily accurate technique, while bringing a significant body of new music to the repertoire of the instrument. 6 different autoharps (including an antique 1885 Zimmermann), and Bryan Bowers' personal instruments) Reid dazzles in chromatic and diatonic styles, and offers lovely re-recordings of some of his better-known autoharp songs. 9 Reid originals, 11 arrangements of traditional tunes. Read more about it. A 2-disc retrospective One song & one instrumentalfrom each of 20 years, with 20 unreleased or out-of-print cuts, plustracks taken from all previous albums. (Unreleased tracks marked with an *) Read more about it. 156 minutes of music chronicle the career of one of today's most productive and versatile acoustic musicians. 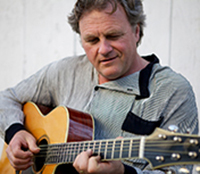 Reid showcases his songwriting and peerless instrumental skills on acoustic guitar, 12-string and slide guitars, 6-string banjo, autoharp, bouzouki, mandocello and lap steel. His arrangements of traditional songs are legendary, and this CD has 14 of them, plus 23 originals, and 3 covers. There are also 9 exciting live tracks from concerts and even some long-ago club gigs. ...and other songs of love, water and darkness.. 60+ mins. 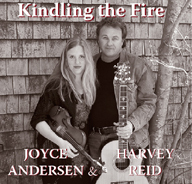 A collaboration with singer/fiddler/songwriter Joyce Andersen. Features their brilliant harmony singing and imaginative instrumental work, with 6 new Reid originals, some traditional songs, and covers of Dylan, Pete Droge, David Francey and Jesse Winchester songs. 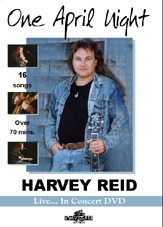 Along with his usual impeccable guitar work, Harvey contributes 4 songs on the mando-cello, 2 with 6-string banjo, plus some powerful slide guitar, lap steel and a taste of his autoharp. A powerful musical statement. 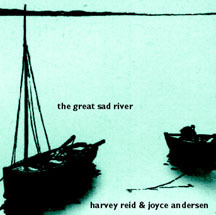 Read more about "The Great Sad River". A tour-de-force of solo steel-string guitar music! 66 mins of all-new compositions and arrangements, recorded in stunning 24-bit quality. Featuring 6-string, 12-string and slide guitar pieces from one of the masters of the instrument. Sets a new standard for sound quality and musicianship. A must-have for fans of Harvey's guitar work, or for guitar lovers anywhere. All cuts played solo by Harvey, with no overdubs, multi-tracking, effects, compression or annoying studio production. Just pure guitar. The 62 mins. of music include 13 new originals, 7 songs, 10 instrumentals; with 8 solo pieces & 6 duets and collaborations with special guests: Brian Silber (violin, viola), Rick Watson (keyboard), Lynn Rothermich (harmony vocals), David Surette (mandolin), Anne Dodson (vocal and pennywhistle), Gary Sredzienski (accordion), Matt Szostak (hurdy gurdy), T.S. Baker (harmony vocal), and Kent Allyn (bass). 3 new autoharp pieces, 2 for the octave mandolin, a new one for the 6-string banjo, plus 4 guitar solos, including one slide guitar piece & ragtime guitar composition #4. 142 minutes!! 2 double- length live CD's, recorded at 15 different concerts, shows the Master Minstrel at his finest. Features 40 songs, 14 originals, 8 covers, 18 traditionals, and 65 mins. of previously unreleased music, with 12 cuts that appear nowhere else. 5 tracks that feature Harvey in group settings. A 16-page booklet has lyrics and Harvey's usual in-depth liner notes and observations on the songs and the gigs. The overall mood of this recording is one of high-energy, and included along with 18 traditional songs and 14 Reid originals are songs by the Rolling Stones, J.J. Cale, and Bill Monroe. The first album (and still the only one) devoted entirely to this un-common member of the banjo family. May well prove to be the definitive one. Features 12-string banjo on 3 of the 21 cuts. Harvey puts the instrument through its paces with classical, celtic, old-time, blues, ragtime + some surprises. Mostly solo, all-digital, 10 originals, 6 re-issues of cuts from earlier recordings*. Re-mastered and re-packaged in Nov 2008, so the music sounds better and art work is different than the old black version. All-instrumental, all-traditional; "Grand Old Songs From Long Ago." The music press loved this one. Hot picking + sweet melodies, features guitar, autoharp + banjo, 9 solo pieces, 10 duets with special guests Dan Crary, Brian Silber, Moondi Klein, David Surette. Mostly fingerstyle acoustic guitar, with some flatpicking, slide & 12-string. 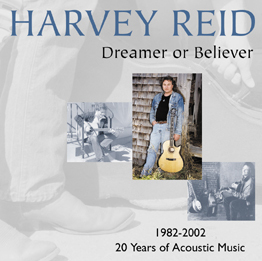 18 acoustic originals, features 12 of Harvey's songs + 7 instrumentals on 6 & 12-string + slide guitar, autoharp, mandolin & bouzouki. Folk, ragtime, baroque, Celtic, gospel, blues, ballads + funky songs. Mostly solo, with Lynn Rothermich on 5 harmony vocals. A good sampler of Harvey's art. A reverent look at the old songs. All-traditional, all-solo,-- just Harvey by himself playing traditional music. A powerful statement by one of the finest acoustic musicians of our time. 6, 12-string & slide guitars, autoharp & banjo with 14 songs and 5 instrumentals. * Perfect for kids and folk music fans. A sampler of a variety of Harvey's work that showcases his compositions and diversity of styles. 10 instrumentals, 9 songs, 6 borrowed from other CD's, 6 re-recordings (*) of out-of-print LP releases, and 4 cuts that appear nowhere else (^). SONGS: All or Nothing*, Prelude: From the Minstrel's Dream (^)*, Vigilante Man, Off To Adventure, Too Old to Ride, Mockingbird, Dying A Little (^), Maggots in the Sheepside/Flowers of Edinburgh, The Coming of Winter, Dreamer or Believer*, Bonnie Streets of Fyvio, Restless Man* (^), Cindy/Cripple Creek*, Waltz of the Waves, Johnny the Fisherman (^), Cryin' Shame*, Chanoyu, California Blues (^), Danny Boy. All-digital, all-solo guitar instrumental. Our best-seller, this one has won Harvey worldwide acclaim. Original, classical, traditional, standards, sea shanties, impeccably played on mostly 6-string, with some 12-string & slide guitar. No overdubs, edits or splices at all. Just great guitar playing. Made Guitar Player Magazine's Top 20 "desert island" list of acoustic guitar CD's. TRACKS: Suite: For The Duchess, The Albatross, Cindy/ Cripple Creek, Summertime, Canal Street Strut, Prelude In Dm, Woodchopper's Reel/Jimmy In The Swamp, The Fisherman, Highwire Hornpipe, Amazing Grace/What A Friend/Swing Low, For Whom The Bell Tolls, Für Elise, Slipped Through My Hand, Still Life With Blues, Daybreak in Dublin, Moon River, Dirty Dish Rag, Elves & The Shoemaker, Sailing In The Lowlands. 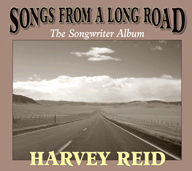 Harvey's first CD, and possibly the first independent folk CD ever made. A consistent favorite with fans and a beautiful artistic statement; sort of a sequel to #103, with similar neo-Celtic/nautical mood.10 instrumentals, 7 songs. 4 traditional cuts, 13 originals. Features a lot of 12-string & autoharp; with some help from Sarah Bauhan (tin whistle), Rick Watson (keyboard) Lynn Rothermich (harmony vocals) + a duet with Susie Burke (vocal+ guitar). No blues or slide guitar. SONGS: Off To Adventure, Silver Blue, Maggots in the Sheepshide/Flowers of Edinburgh, The Lakes of Pontchartrain, The Keeper of the Light, Pieces of Eight, Show Me the Road, Midnight on the Water, Dance: The Storm Is Over, The Boatman, Southwind, April Rain, Crown the Queen, To the Western Wind, Waltz of the Waves, Candlelight, A Windy Grave. 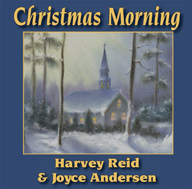 An extraordinarily lovely and spirited album of Christmas instrumentals on guitar & autoharp. 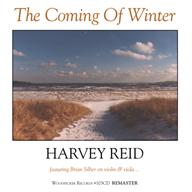 Just the unadorned beauty of this timeless music and one of today's finest players, and one of Harvey's most popular and enduring recordings. Many of the cuts here were originally recorded in 1984 and released on a limited-edition cassette titledThe Christmas Project. The additonal cuts were added in 1987 and laterwhen the CD was released. SONGS: God Rest Ye Merry Gentlemen, Deck the Halls, Angels We Have Heard on High, Greensleeves, Santa Claus is Coming to Town, Silent Night, The Little Drummer Boy, Away in a Manger, Good King Wenceslas, Ode to Joy, Hark the Herald, O Tannenbaum, Jingle Bells, Carol of the Birds, The Heart of the Minstrel On Christmas Day, Rudolf, O Holy Night. Lovely, passionate and mysterious music, recorded in the Fall in a cottage on the coast of Maine. 9 instrumentals and 4 songs set a powerful mood & reflect the power of the ocean and the impending cold weather. Designed to wear well during repeated listenings during the winter. Mostly 6-string & a lot of autoharp. Includes a remarkable 23 minute guitar piece*. Features Brian Silber (violin & viola) on 8 cuts.